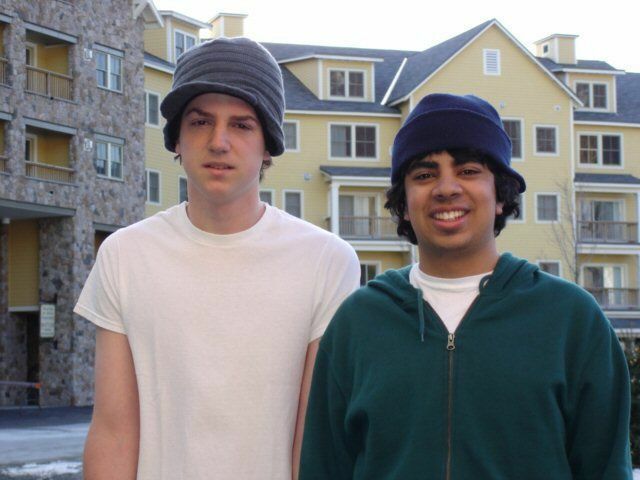 My friend and me outside Jackson Gore Inn in 2008. Both locals and guests think it's a great family mountain. 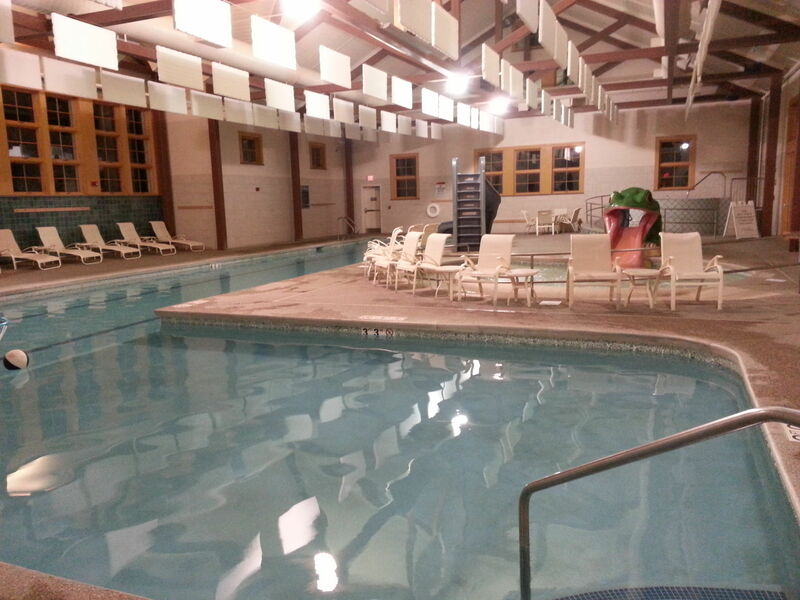 The Spring House has a pool and recreation facilities. 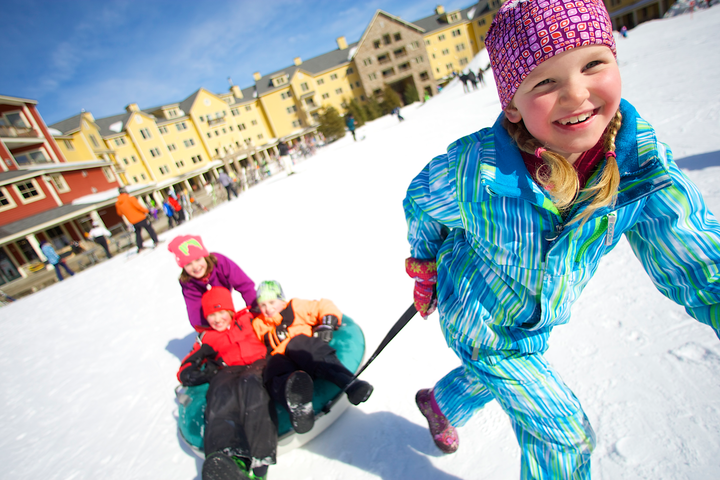 Okemo has everything you and your family need for a winter getaway. Ten years ago, it was the first ski resort I ever visited, tagging along with a friends’ family to take in the sights of Central Vermont and spend a day learning how to ski. This return trip, over a decade later, was a reminder of what a great destination Okemo is, and I was also able to appreciate how it’s improved… almost as much as my skiing skills. 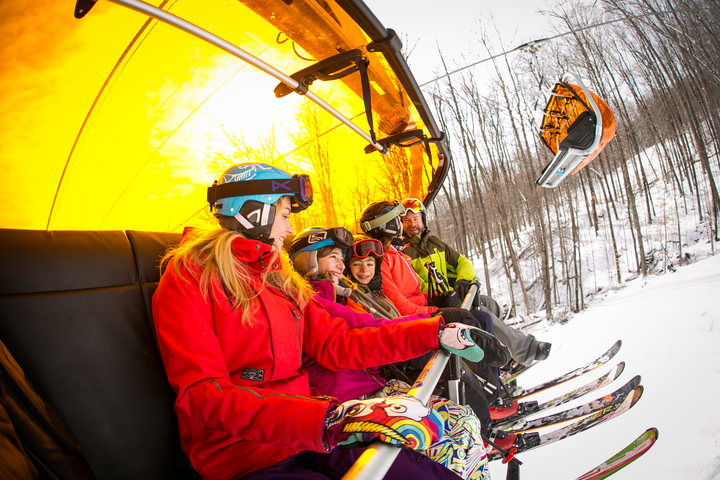 The Sunburst Six lift at Okemo has heated seats and a shell to keep everyone warm on the uphill journey. Photo c. Okemo Mountain Resort. I stayed once again at the Jackson Gore Inn which still provides a more intimate and family-friendly feel than other mountain resorts without sacrificing all the amenities and access of a larger ski village. A roaring indoor fireplace welcomes you in the lobby, and an outdoor fire pit in the courtyard warms you up after a full day of skiing. Both set the scene for a classic ski lodge experience, which continues into the rooms where suites are outfitted with an electric fireplace, comfortable beds and cozy furniture to relax in. For Vermont’s homegrown resort, 2018 brought a change of ownership, notes contributor Ron Bozman, when the mighty Vail Resorts purchased Okemo from longtime owners, the Mueller family. Vail had previously bought Vermont’s Stowe and took over management of Mount Sunapee, New Hampshire and Crested Butte, Colorado in the deal. Though FTF had been told that there were many “back-office” changes, on a December 2018 weekend we noticed the same friendly, competent staff support and range of superb, well-groomed runs on the mountain. The resort’s facilities remain warm and welcoming to families and the instructional staff excellent, particularly with children. As part of Vail Resorts’ two-year, $35 million commitment to investments across Okemo, Mount Sunapee and other new resorts. The Mountain Lodge at Okemo and condos in the base village and around the slopes will get an updated look and new furnishings. Additional investments after 2019 will be based on opportunities to improve guest experiences and make it one of Vail’s premier family oriented mountain resorts. The one functional change that this season’s visitors get is an EpicDay lift ticket, which provides easier access as the pass is electronically scanned from within your pocket. If you bought Vail’s Epic Pass early in the season (prior to Dec. 2, 2018), you could have tapped into a variety of season passes and multi-day passes, some of which are good for all Vail Resorts, including those in Colorado, California and Canada, plus global partners. That opportunity comes again for the foresighted skier and snowboarder, when the 2019 pass options become available anew at the lowest prices in mid-March 2019. At Okemo, family relaxation isn’t relegated to just the rooms; the pool area includes hot tubs and pools — both indoor and out — spacious and easily accessible. Other amenities include a state of the art gym at the adjoining Spring House and massages for aching post-ski muscles, an arcade room for kids, ski-check so you don’t have to lug your skis to your room, and shuttle service to the Okemo base lodge. But with rentals, lift tickets, and the Coleman Brook Express lift all on-site, getting to the main lodge isn’t a necessity for most visitors. Mid-mountian dining options include lots of healthy, local fare to enjoy while warming up. Photo c. Okemo Mountain Resort. One of the most notable improvements since my last visit is Okemo’s expanded dining options across the mountain. As with any mountain resort, lunch spots should be ample and easy to reach off several trails. 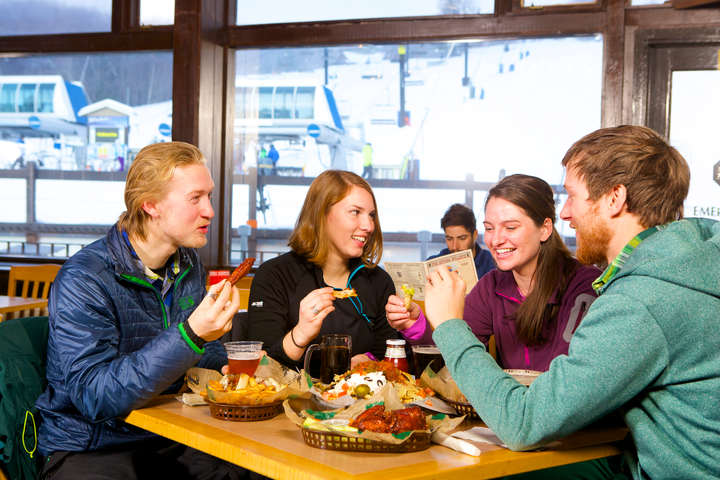 At Okemo, that includes several places to grab a quick bite and a warm drink at the main base lodge, at Jackson Gore’s Roundhouse, and at Summit Lodge, right off the Sunburst Six, Okemo’s newest and most impressive high-speed chairlift. 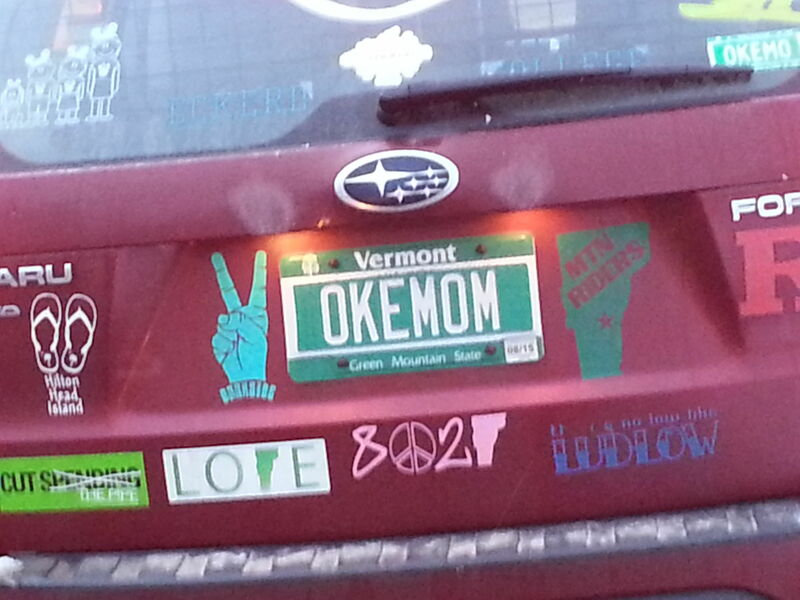 As for the skiing itself, it’s clear that Okemo has focused energy on improving both lifts and snowmaking. Even in early-December after a temperature fall, the snowmaking team was able to provide enough coverage to open almost 40 trails across the mountain, and they’ll continue to provide strategic coverage to the mountain even as Mother Nature starts to do her part — making sure that conditions are optimal throughout the season. With 120 trails providing a great mix of shallow slopes for beginners and more challenging terrain for the more experienced, there really is something for everyone with beautiful views of the surrounding valley. And the recent lift improvements make the ride up the mountain almost as fun as skiing down, as most of the lifts have padded seats and move along at a good clip, and the bubble lifts at Quantum Four and Sunburst Six provide both shelter from the wind and heated seats! Never skied before or bringing your kids for the first time? Not to worry! There’s plenty of sledding at Okemo outside the Jackson Gore Inn. Photo c. Okemo Mountain Resort. Not only are there group and private lessons for anyone looking to learn the ropes or fine-tune skills, but there are also Children’s Programs staffed by some of the kindest and most patient instructors I’ve seen. Sure to make you and your kids feel more confident on the slopes, they offer both First Tracks and Double Tracks, a one or two day lesson package to suit your needs. Of if you have a child not yet ready for the mountain, Jackson Gore’s DayCare is a fully-licensed childcare facility for 6-month to 4-year-olds, adjacent to the inn. Finally, I couldn’t helping remarking how many other outdoor activities there are in addition to skiing and snowboarding. The Mountain Coaster has been added since I last visited. This thrilling yet family-friendly ride that winds its way through the lower section of Jackson Gore is the most notable activity, but there are also snowshoeing tours, an ice skating rink, and the nearby Nordic ski center. With Okemo Mountain Resort as your base, there’s more than enough to keep everyone active and enjoying wintery Vermont. Thanks to Hannah Read who contributed to this story and Ron Bozman for his updates. Good address for ski. My daughter loves skiing very much. It will be a good option for us for the next winter holiday.